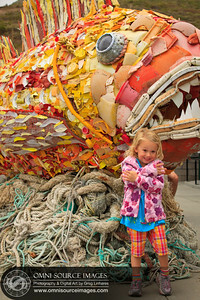 Henry the Fish: Washed Ashore Art Exhibit - Marine Mammal Center. 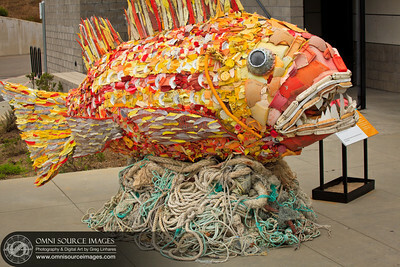 Materials: plastic pieces, aluminum cans, dish soap bottles, lids, buoys, toys and recycled rebar. Sea Star: Washed Ashore Art Exhibit - Marine Mammal Center. Materials: glass and plastic bottles, white plastic trash and foam. This sea star is made from glass bottles that originated all over the world, yet were found along the beaches in Oregon. 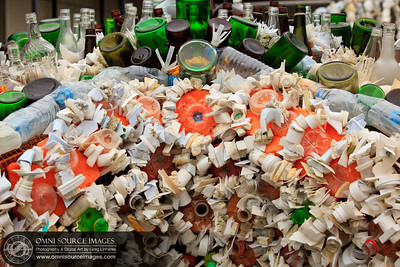 In the United States, only two in five glass containers are recycled! These bottles are filled with water and tuned to create a giant musical instrument! 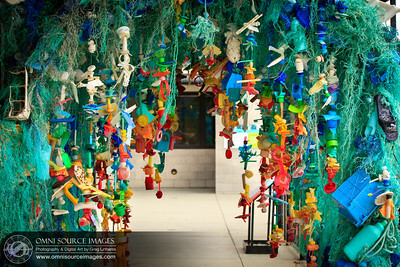 Gyre: Washed Ashore Art Exhibit - Marine Mammal Center. 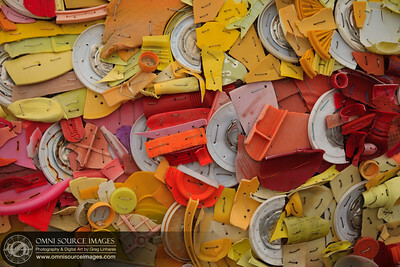 Materials: plastic house hold objects, toys, crates and synthetic fishing rope. 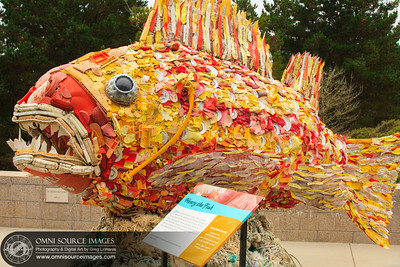 It is estimated that 11 million tons of plastic ride the North Pacific Gyre between Asia and North America. 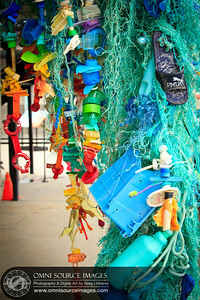 The plastic eventually washes ashore on beaches or breaks down into microscopic pieces! 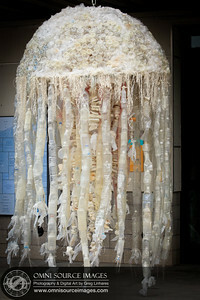 Giant Sea Jelly: Washed Ashore Art Exhibit - Marine Mammal Center. 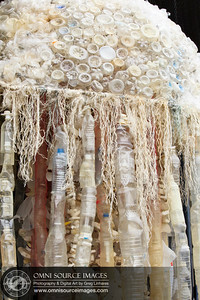 Materials: recycled rebar frame, plastic bags, shredded synthetic rope, water bottles and polystyrene. 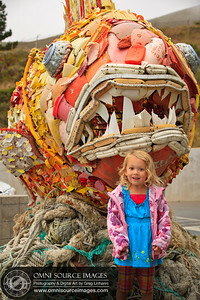 Henry the Fish & Maisie: Washed Ashore Art Exhibit - Marine Mammal Center. 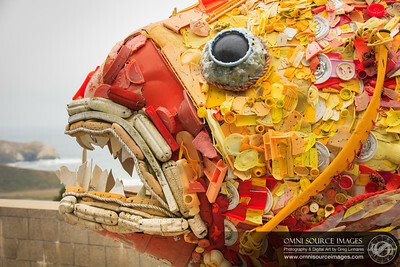 Materials: plastic pieces, aluminum cans, dish soap bottles, lids, buoys, toys and recycled rebar. 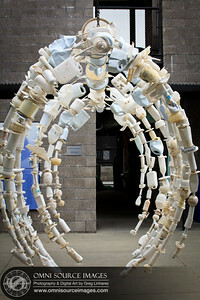 Gyre - Close-up: Washed Ashore Art Exhibit - Marine Mammal Center. 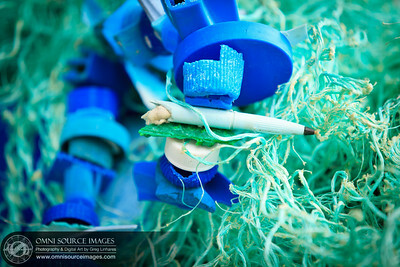 Materials: plastic house hold objects, toys, crates and synthetic fishing rope. 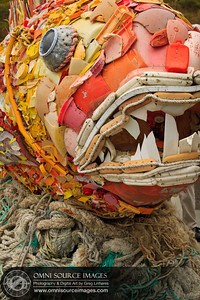 It is estimated that 11 million tons of plastic ride the North Pacific Gyre between Asia and North America. 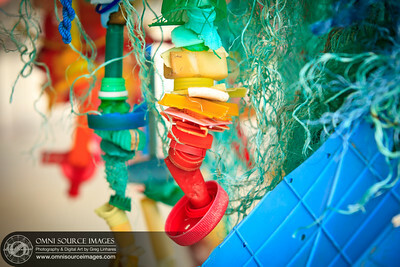 The plastic eventually washes ashore on beaches or breaks down into microscopic pieces! 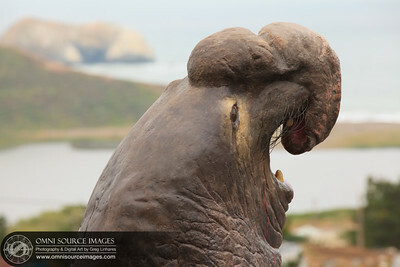 Sea Star - Close-up: Washed Ashore Art Exhibit - Marine Mammal Center. Materials: glass and plastic bottles, white plastic trash and foam. 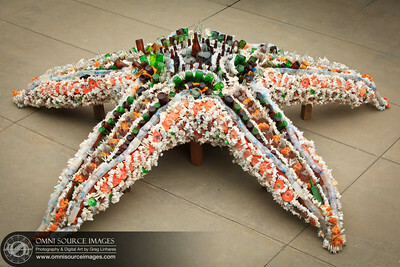 This sea star is made from glass bottles that originated all over the world, yet were found along the beaches in Oregon. 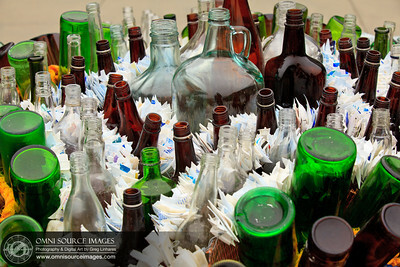 In the United States, only two in five glass containers are recycled! These bottles are filled with water and tuned to create a giant musical instrument! 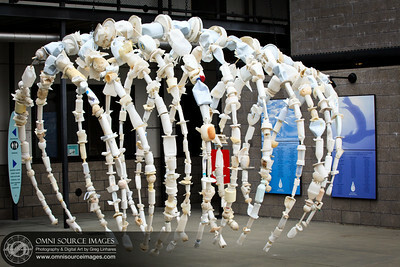 Whale Bones: Washed Ashore Art Exhibit - Marine Mammal Center. 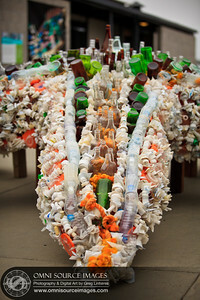 Materials: recycled steel frame covered with bottles, jugs, and other large white plastic items. A gray whale found dead on the coast of Washington had plastic bags, towels, surgical gloves, sweat pants, duct tape, fishing line and a golf ball in its stomach! 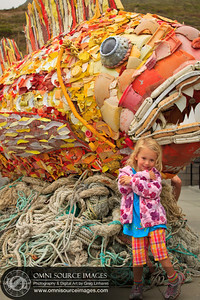 Henry the Fish - Close-up: Washed Ashore Art Exhibit - Marine Mammal Center. 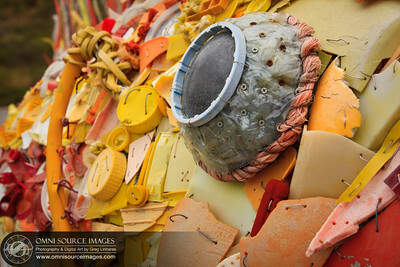 Materials: plastic pieces, aluminum cans, dish soap bottles, lids, buoys, toys and recycled rebar.